Enjoy a night at one of Madrid’s authentic flamenco joints and enjoy an evening sightseeing tour by Hop-On Hop-Off bus, too. Start the evening with a tour by open-top, double-decker bus, and admire sights of the Spanish capital’s regal attractions including Madrid Royal Palace and Paseo del Prada. 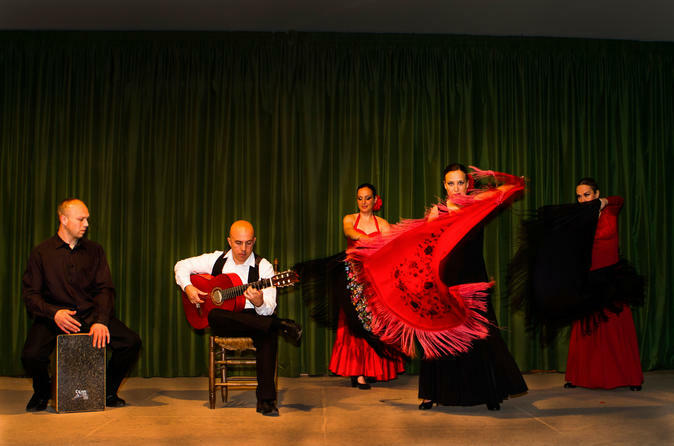 Then, enjoy a fiery flamenco show at Café de Chinitas, a popular 'tablao' (flamenco venue) along with a preshow drink or 3-course dinner. Board your sightseeing bus at Madrid’s Gran Vía in the evening. Then, sit back, put on your headsets to hear the audio commentary, and enjoy the views as your open-top, double-decker Hop-On Hop-Off bus travels past Madrid’s regal palaces and monuments. Admire top attractions such as Madrid Royal Palace and the tree-lined Paseo del Prado, home to the Prado museum. Then, pass the Plaza Mayor and Puerta del Sol among other landmarks before you travel along the stately Gran Vía. After your 80-minute ride, walk to Café de Chinitas, a popular Madrid tablao. As you take your seat, absorb the atmosphere and admire the beautiful, Moorish-style show room. Sip on a drink — perhaps wine, sangria or soda — or alternatively, upgrade to include a 3-course dinner with wine and mineral water before the show starts. Then, enjoy the exhilarating flamenco performance, and watch the dancers, singers and guitarists display their artistry during a 1.5-hour show. See the Itinerary for the bus sightseeing route and a sample dinner menu.